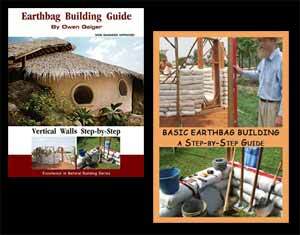 All of our earthbag projects have been built using the same road base material. It has worked exceedingly well. After tamping, the earthbags are solid and turn into very hard earthen blocks. Here I am testing the hardness of bags on our roundhouse. You could pay extra for an engineered mix, of course, and be certain of an ideal ratio. But for us it’s cheaper to just add a little extra clay and then test the results, so that’s what I did. I made a sample earthbag with 5% extra clay to see how it would turn out. You could do the same thing with whatever type of soil you have. Make a few samples and then compare them after they dry. Here’s the basic procedure. We typically use five 2-gallon buckets of soil per bag. This means each bucket is equal to 20%. I wanted to add 5% additional clay, so I prepared ¼ bucket of sifted clay and mixed approximately the same amount with each bucket of soil. The mix appears stickier and looks like it will produce a stronger earthbag. Text for video available at my Naturalhouse YouTube channel.